"I think he [Allan McNish] also suffered by being the first high profile young test driver in F1. Until then drivers would have the occasional test with one or more teams and then either be signed to race or not but he was the first to have a contract as a full time test driver while in the junior formulae. I think this worked against him getting a full time drive. McLaren were happy with Senna and Berger and other teams saw McNish as a McLaren man who may drive for them short term but as soon as Ron came calling he would disappear off to Woking." That made me think. We have recently seen the disappearance of realistic test driver positions because of the limitations set on testing. Many have decried this move as it prevents young drivers from gaining a year's experience in F1 cars before actually entering the competition - and I admit that I happily went along with this notion until I read what Steven had to say. It struck me then that test drivers may not be such a good idea after all. In previous years, test driving became almost the standard route for progression from lower formulae to F1 and many of the young stars of today served their apprenticeship as test drivers. Kovalainen, Kubica, Sutil, Glock, Vettel, Piquet and Davidson all spent time as test drivers before getting a race seat in the sport. With more than half of that list proving very useful competitors (the jury remains out on the others), it would seem that the system worked pretty well. New drivers gained some experience in the car and with the team, and learned at least the rudiments of setting it up for good lap times. So far so good. What happens if we look at those few rookies who went straight from a feeder series into a race seat, however? There are only three to be considered at the moment: Hamilton, Bourdais and Nakajima. And here it has to be admitted that they show no signs of suffering from such a huge leap into the big time. I hardly need to list Hamilton's achievements in his F1 career so far - Steven considers him the best driver in the sport and, while I reserve final judgement on that, I am coming to the same opinion. But maybe Hamilton is special, that one in a million who could handle the promotion with apparent ease. What of the other two? They are more difficult to assess, being in less competitive cars, but Sebastien Bourdais is not being put to shame by his much-hyped team mate, Vettel. Indeed, he has the better record so far. 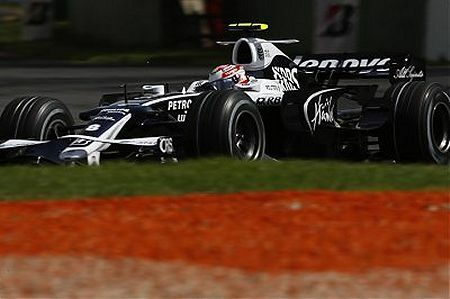 And Kazuki Nakajima has performed well above expectations, being reliable in the races, occasionally faster than his team mate, Nico Rosberg, and scoring points quite regularly. Nakajima is perhaps the most interesting case, for the history book says he should be a good deal less useful than he is proving to be. Although he was a regular visitor to the podium in GP2, he never actually won a race and his seat at Williams was largely thanks to his being a Toyota protegé. Japanese drivers have a reputation for recklessness but Kazuki has had only one DNF so far, and that through no fault of his own. And he is steadily adding to his points score, surely a good sign for any newcomer. Putting aside my Nakajima bias for a moment (before the season started, I tipped him as one to watch), it has to be said that none of the three who short-circuited the standard route seem to be suffering from that fact. If anything, it looks as if time spent as a test driver is actually a handicap; consider how Kovalainen struggled in his first few races and how Piquet does the same this year. Glock seems nothing to write home about, Vettel has yet to really impress and Davidson, who has more testing experience than the rest put together, never made his team mate, Sato, look stupid. It may be coincidence but, on the evidence before us, it looks to me as though test driving was a very bad idea from the driver's point of view. Whatever the reason for that, it must be said that, for once, the FIA have instituted a good rule change, even if accidentally. And it goes to show that we should not be so quick to condemn change - sometimes reality proves all our theories wrong. I think in recent years we have seen more rookies spend a year as F1 test drivers before getting race seats. I'm not convinced it does anything for them: Lewis Hamilton clearly didn't suffer from going straight from GP2 to F1, whereas Heikki Kovalainen looke race-rusty early last year and so has Nelsin Piquet Jnr this year (although in the case of Piquet we still don't know if he's rubbish or not yet). To take one of your examples, it clearly hasn't caused Nakajima any problems either. I am glad to be your inspiration. The difference between McNish and the others quoted was that he had a testing contract while racing and because of the lack of restrictions he did a lot of testing. I think he suffered more through perception than by the act of testing. Nowadays no team would hesitate to sign a rival team's test driver but because he was the first there seemed to be an assumption that he had a long term future at McLaren so there was no realistic possibility of signing him. Keith: I can remember how many of us thought it was a pity when the day of the test driver came to an end, pointing out how it reduced the number of seats available for new drivers to get a foothold in F1. Now it looks as though we were wrong - those extra seats were actually passports to the twilight zone (look at Davidson and Montagny!) and it is a good thing they are gone. Steven: We tend to think alike and so I suppose it is no wonder that I often find inspiration in something you have written. The writing game is the one field in which pinching each other's ideas is not only legal but actively to be encouraged! Clipped from Clive: (look at Davidson and Montagny!) and it is a good thing they are gone. Care to elaborate on this remark? I have to admit a certain bias towards McNish. Watching motor racing in Scotland you don't get to see much of the young guys before they have a reputation. I saw McNish in his third ever car race and he was a revalation. At least he was until he spread the car over half of Ingliston. To me that day he was something I had never seen before and it seemed obvious that he would go far. Bear in mind with the exception of one season of Johnny Dumfries Scotland had not had a GP driver since JYS so any sign of someone who may be the next was something to be seized on. He is the only driver before this season that I have seen in Formula Ford or its equivalents that I have told people to watch. At Knockhill a few months ago I saw a kid I had never heard of before and he is awesome. Watch out for Wayne Boyd. Number 38: The second half of the quote refers to test driving seats. And the mention of Davidson and Montagny in the brackets was because they are excellent examples of drivers consigned to the twilight zone. Both spent too long as test drivers and were race rusty by the time their big chance came along. Had they been pitched into the fray from the beginning, they might well have been more competitive - the talent was certainly there. Steven: I'll keep an eye open for Wayne Boyd - thanks. I think it's natural that we should be especially interested in drivers from our own countries. As long as we retain a realistic view on their talents, it does no harm. And, as a Sassenach, I still have hopes for Button (almost did a post on that one when I read your opinion of him on Keith's site). It is quite telling that you should rate Hamilton so highly, therefore. He is English and your view of him carries more weight as a result, I think. The Scots and the English have a long history of antagonism, especially in sports! Hamilton is a good Scottish name and his grandfather is called Davidson Hamilton so I am sure there is Scottish blood in there somewhere. I have never had the slightest interest in a driver's nationality and it annoys me when people accuse me of pro-British bias. Me pro-British? I find driver nationality quite interesting, if only from a statistical point of view. How does one explain the enormous number of Brazilian drivers through the years, for instance? If it were just a matter of an F1 presence in each country, where were the Spaniards before Alonso came along? There has been a Spanish GP for donkey's years. And all those Finns - from a country that has never had a GP. It's interesting, that's all. Another driver to suffer the test driver curse is Alex Wurz. This was the guy who got the better of Schumacher in that unforgetable wheel banging session at Monaco. He went to McLaren with the plan of being test driver for a year and didn't get a race contract for 7 years. I think your use of Kaz as an example of non-testing may be slightly unjustified, seeing as he completed many miles of testing for Williams last year. That's true, Rohan, I had forgotten that. But I still think he deserves to be included on the "straight from feeder to F1" side of the fence since he raced a full season in GP2 in 2007 and came fifth in the championship. Testing was already much curtailed last year and so he had very little experience of it in comparison to earlier test drivers like Kovalainen and Kubica. Piquet, too, had little experience of testing in 2007 for the same reason but did not compete in GP2, effectively having a year away from racing as a result. It is this that probably causes the effect we observe - drivers do go rusty if they do not race for a long period. I think the problem is that the people who choose drivers either wouldn't recognise ability if it hit them between the eyes or they are choosing drivers for the wrong reasons. We keep hearing that Sebastian Vettel is a great prospect for the future. However he lost the 2006 Euro F3 to a Scottish (yes I know I am biased) driver by the name of Paul Di Resta who is the cousin of Dario Franchitti. Di Resta is now entering his second season in the DTM having been unable to raise a GP2 budget. It has always been difficult for single seater drivers to adapt to the DTM. Hakkinen for example struggled. Paul is currently second in the DTM championship in his second season despite having raced nothing more powerful than F3. Some drivers find the step to F1 to be a difficult one but mainly that is because the wrong drivers are given the chance. In the past drivers didn't hang around in F1 either because they died or were injured or simply because careers were shorter. So logically there should be more people around capable of driving well in F1 than there ever has been so you have to question why so many drivers struggle. I think the careers of guys like Paul Di Resta give us a clue. I wonder if what we're talking about at this point is similar to the issue the music business faces, that there are more people in the world that can make music well than there are people that would pay money to see them in a lucrative fashion? The notion of the test seat, in my interpretation, is the same as the practice squads of NFL (pointy) football, or reserves in round football, in this case extra drivers are kept around to help the "stars" avoid injury. Spending your career in the reserves or as a test driver does indeed keep you off the regular playing field, and I think we'll all agree that pushing and overtaking in GP2 is not the same as pushing and overtaking in F1. Regardless, testing is what it is. I think what we're lamenting is that there are not enough driving positions for us to see these guys drive in their prime. The same happens in many walks of life. There are vast numbers of Scots with Italian heritage. Traditionally they ran the local cafes and ice cream shops in almost every town in the country. They started arriving about 100 years ago and a lot were POWs who stayed on after WW2. I think the practise squad analagy was more accurate before the testing limits were brought in but I still think in some cases it is accurate. Why do McLaren pay Gary Paffett? They clearly have no intention of ever racing him and he does very little testing. Thank you, Steven, that makes quite a bit of sense on both points.